As time passed and Nando’s thoughts turned increasingly to his father, who he knew must be consumed with grief, Nando resolved that he must get home or die trying. He would challenge the Andes, even though he was certain the effort would kill him, telling himself that even if he failed he would die that much closer to his father. It was a desperate decision, but it was also his only chance. So Nando, an ordinary young man with no disposition for leadership or heroism, led an expedition up the treacherous slopes of a snow-capped mountain and across forty-five miles of frozen wilderness in an attempt to find help. Thirty years after the disaster Nando tells his story with remarkable candor and depth of feeling. 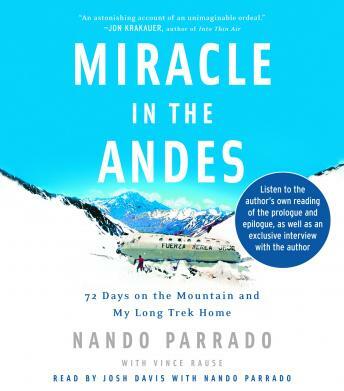 Miracle in the Andes—a first person account of the crash and its aftermath—is more than a riveting tale of true-life adventure: it is a revealing look at life at the edge of death and a meditation on the limitless redemptive power of love.